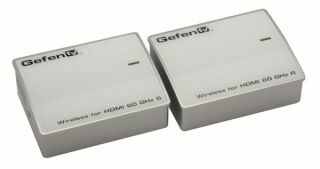 The What: Gefen’s new Wireless for HDMI 60 GHz is designed for any in-room transmission of high quality, 1080p full HD video up to 33 feet (10m). The What Else: The Wireless for HDMI 60 GHz Extender delivers 3DTV, is plug and play and supports all audio formats including the new lossless High Bit Rate (HBR) 7.1 channel Dolby True-HD and DTS-HD Master Audio. The ability to pass through uncompressed video, lossless audio and 3DTV is ideal for high performance commercial or residential installations, according to the company. The How: This extender uses a method of wireless extension that takes full advantage of the WirelessHD specification, which is based on the 60 GHz EHF (Extremely High Frequency) radio band. This high quality method of extension eliminates the need to run cables, making it ideal for retrofits or any environment that wants to streamline cabling. One More Thing: Due to its in-room transmission and use of the uncluttered 60 GHz frequency band, this extender can perform seamlessly alongside other wireless devices in adjacent rooms with zero interference. It is easy to install, requiring a connection of the video source to the sender and of the display or projector to the receiver.